Public transport is generally very safe and you can commute back and forth on trains and buses without incident. However, things still can go wrong when you are using public transport and there are hundreds of personal injury claims put forward each year by victims of train and bus accidents. If for instance, you are travelling by coach, train or bus and it is forced to stop suddenly or is involved in a crash, there is the very real risk of injury. When these kinds of accidents happen, you could be eligible to claim compensation. In these instances, it is not a typically case of who was at fault because you were a passenger at the time and had no control. These cases generally result in compensation from the local travel authority or managing body of the train, coach or bus line. Here we will discuss these kinds of accidents and injuries in greater detail, then help you to understand what you need to do and why you should do it if you are involved in an accident while using public transport. Read on for our guide to public transport accidents and how you can set about making a successful claim- to get the compensation you’re entitled to. What Are Considered Public Transport Injuries? Who Can You Claim Compensation Against? If you have been involved in an accident on public transport and want to make a claim for compensation due to injuries you sustained, you are likely interested in knowing who you can actually make a claim against. As drivers have the responsibility towards the safety of their passengers, they are liable to an extent. However, as drivers are merely employees for their transport company, the company itself is also liable. They also have the responsibility towards maintaining their fleet of vehicles and ensuring they are roadworthy and safe for passengers. If a crash is caused by someone driving a car though, due to their reckless driving or some other form of negligence they are who you should claim compensation against. If you have evidence that the driver themselves was at fault, such as CCTV in a taxi or bus, then it may be possible to make a claim against the individual rather than the company operating the transport. Realistically, How Much Compensation Can I Claim? 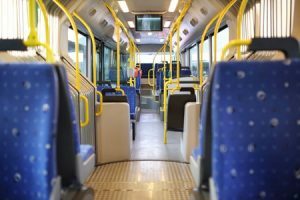 It is likely you are interested in knowing just how much compensation you can claim if you are involved in a public transport accident. As noted earlier, whiplash is a very common injury from accidents on public transports. Although it is hard to pinpoint just how much compensation you can get from a successful claim, as this will depend greatly on various factors from incident to incident, there are some examples that can be used as a guide. For instance, minor whiplash could see you awarded as much as £3,810. For severe injuries to your neck though, it could be something in the region of £57,000 to £115,000 approximately, as recovery from these injuries takes a lot longer. If you suffer a minor injury to the head, caused by a sudden stop, compensation could be anything from just under £2,000 to as much as £11,200. As it is hard to say how long it will take to complete a compensation case, without a professional solicitor giving their opinion on your injuries and accident. So it is worth understanding that it may take some time until you will see the money. Obviously, above all else, your recovery is the most important thing. However, when you are ready, it is crucial that you get in contact with a professional lawyer who has experience in public transport accident compensation claims. They will be able to guide you through the process and get you the money you deserve. Some claims have a cut off of around 3 years, so it’s imperative that you get the ball rolling as soon as you are able after your accident as vital evidence may be lost which could support your claim. What Should You Do If You Are Involved In A Public Transport Accident? As previously noted, you should concentrate on recovering from your injuries as best you can. However, you also need to make a compensation claim. If an accident has happened that wasn’t your fault, you are due compensation to cover the various financial issues and trauma you have suffered. Money won’t make undo the damage or injuries the incident caused, or reverse time and make it so it didn’t happen. However, it will help to reclaim loss of earnings, pay for expensive medical treatments you may require and help with any adjustments you have to make to your home or lifestyle as a result of life-changing injuries. One vital thing to note though is that you shouldn’t attempt to handle the compensation claim yourself. Personal injury law and the law surrounding public transport accidents is very complicated and the process can be long and drawn-out. You need the help of someone who understands the regulations and can cut the jargon to help you with your claim.